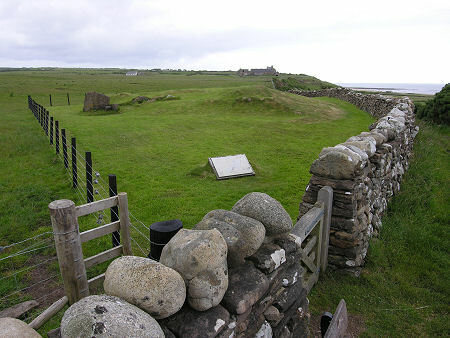 The Torrylin Chambered Cairn lies above the east bank of the Kilmory Water and less than a quarter of a mile from the south coast of the Isle of Arran. Incidentally, we have called it the Torrylin Cairn because that is the spelling of the name given on the Historic Environment Scotland information board at the cairn: we have also seen the name written as the Torrylinn Cairn, which conforms with the name of the nearby village. Just to add further to the confusion, the cairn has also sometimes been called the Torlin Cairn. 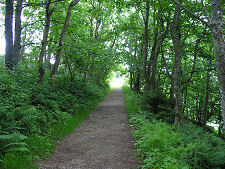 Access to the cairn is either from Lagg or from Torrylinn, two parts of the village of Kilmory. Torrylin Cairn is of a type of ancient monuments called Clyde Cairns which are found scattered across southwestern Scotland, especially around the Clyde Valley and Estuary. They were typically built in abut 3,300BC and all have a similar layout. 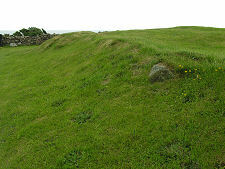 As originally built, Torrylin Cairn would have comprised a large rectangular mound surrounded by a kerb of stones. 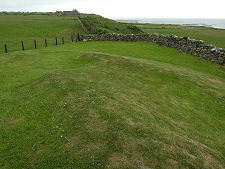 One of the narrow ends of the cairn would have been cut away to form a concave face, lined with stone, leaving a paved "forecourt" in front of the cairn. 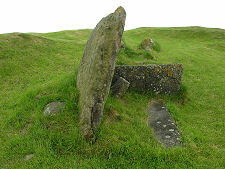 In the centre of this end of the cairn a pair of upright stones would have marked the entrance to a rectangular burial chamber extending into the body of the cairn. 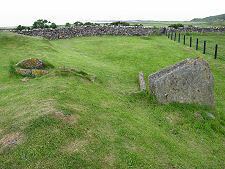 The bones of the departed were deposited within the cairn after being defleshed and it is assumed that the forecourt area was designed to hold some sort of ceremony to mark the burial. As you see it today, it is difficult to connect Torrylin Cairn with this idealised description. Both ends of the rectangle have been removed by later farming, leaving just a humpy mound some 19.8m or 65ft in diameter, from one end of which project some of the stones that would originally have lined the burial chamber. 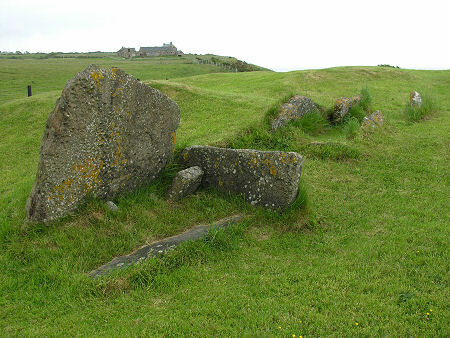 The cairn was excavated in 1861, and again in 1896 and 1900. The 1900 excavation unearthed the remains of six adults and two children from the cairn. 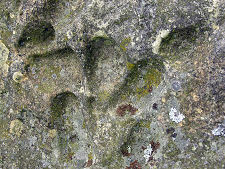 A local story suggests that those who were laid to rest here did not take lightly to being disturbed in earlier times. One farmer is said to have dug up parts of the cairn, scattering the contents over a nearby field, but keeping the largest skull as a souvenir. When he got home, a strong wind started shaking his house while leaving those of his neighbours untouched. The farmer took the hint and tried to make good what he had done by collecting what he had taken from the cairn and returning it. From that day on, however, he remained haunted by the spirits of those he had disturbed until, one day, his horse was startled for no apparent reason and he fell from it to his death.